Apple Shares Plunge After Earnings: Are You Panicking Yet? Let's not beat around the bush. 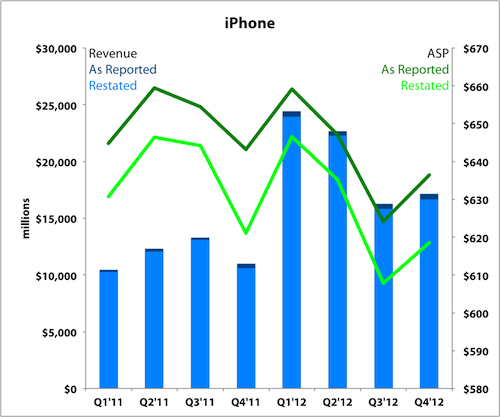 In several ways, Apple's fiscal first quarter earnings release did leave a little to be desired in some key areas. iPhone units came in below estimates, particularly when considering the optimistic expectations suggested by Verizon's activation figures. Mac units legitimately plunged both sequentially and year over year. Gross margin contracted to the lowest point in two years. In after-hours trading, shares reached as low as $457.30, shedding nearly $57, or 11%, from where they closed. That's $53 billion in market cap lost in about an hour. The company sold 47.8 million iPhones in the December quarter, 29% higher than a year ago. That was shy of the roughly 50 million that most investors were expecting, and well below the 56 million figure suggested by Verizon's activations. The iPhone 5 was constrained throughout most of the quarter, but sales climbed during the tail end as production ramped up. Tim Cook said that iPhone 4 supplies were constrained for the entire quarter. That coincides with the fact that only half of Verizon's iPhone activations were the newest model, indicating strong demand for older models. 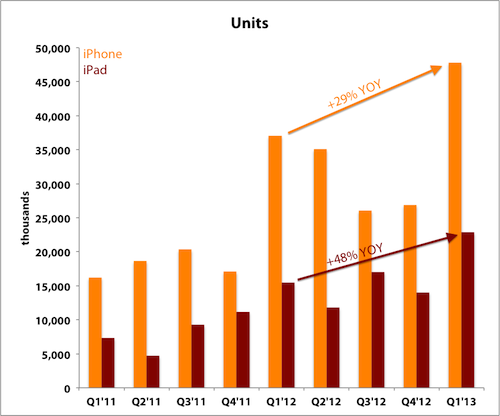 iPad units were solid at 22.9 million, driven in part by strong demand for the iPad Mini. That's a jump of 48% over last year. Cook said that the smaller tablet continued to be constrained during the quarter and that Apple expects to achieve demand balance this quarter as it ramps up. Source: Earnings releases. Fiscal quarters shown. Average selling prices expectedly dropped to $467 with the introduction of the iPad Mini, along with the continued presence of the iPad 2. That was a $101 drop in ASP from a year ago. The total Mac units of 4.06 million were undoubtedly light, dropping 22% year over year and significantly underperforming the broader PC market (negative 6%), breaking Apple's streak. Apple no longer reports the mix of desktops and laptops, but Cook attributed most of the shortfall to the "significant" iMac shortages that he warned about last quarter. I underestimated how much iMac shortages would impact the quarter, since the relative importance of the desktop business has continued to decrease. Specifically, Cook said iMac units were down by 700,000 year over year due to the constraints, which alone represents a large chunk of the 1.1 million decrease. The 21.5-inch model shipped in November and the 27-inch model shipped in limited quantities in mid-December. After announcing them, the previous generation was no longer available, so Apple simply had no flagship desktop to sell during much of the quarter. Desktop ASP last quarter was almost $1,300, so missing out on 700,000 units represents $910 million in lost revenue. The one saving grace is that Apple customers are a loyal bunch, so most of those sales are simply being pushed into the March quarter instead of being lost altogether. Cook said laptop units were "in line" with IDC's estimates of of the broader market. Apple has reorganized how it reports its results in several ways. iTunes has been combined with software and services. Apple has replaced peripherals with accessories, and unbundled first-party iPhone and iPad accessories from iPhone results and moved those sales into this new accessories segment. These accessories were previously reported in their related product segments, slightly increasing reported revenue and ASP figures. The move is intended to increase transparency and isolate actual device revenues, which are more relevant. Apple has restated its financials for the past two years. Source: Apple Investor Relations. Fiscal quarters shown. As the company's "Greater China" business has exploded, Apple has now broken out that segment from its broader Asia-Pacific segment. This is very helpful for investors, as previously this data was only given out on conference calls. The figures in this new Greater China segment don't exactly line up with previously provided data, primarily because Apple still reports retail results separately, which include stores in numerous countries around the world. Total Greater China revenue including retail was $7.3 billion, up 62% from a year ago; compare that to the $6.8 billion revenue from Greater China excluding retail. I would suggest it's good to question the accuracy of any kind of rumor about build plans and also stress that even if a particular data point were factual it would be impossible to accurately interpret the data point as to what it meant for our overall business because the supply chain is very complex and we obviously have multiple sources for things, yields might vary, supply performance can vary. The beginning inventory positions can vary, I mean there is just a long list of things that would make any single data point not a great proxy for what's going on. Apple's supply chain is a living, breathing entity with a lot of moving parts. I wouldn't purport to know more than Tim Cook about how all those pieces fit together, and neither should the WSJ, Nikkei, or investors. I've said it before and I'll say it again: Investors need to trust Tim Cook more. Apple's historically been known for its lowball guidance, but it seems those days are at an end. CFO Peter Oppenheimer said guidance used to reflect a "conservative point estimate" of results that the company felt reasonably confident it could hit, but now it plans to provide a range of what it thinks it will achieve. It seems like a semantic distinction, but analysts interpreted it as Apple moving away from its comically conservative guidance of the past and toward more pragmatic forecasts. This is a trend I've noted before. Source: Earnings releases and conference calls. Fiscal quarters shown. 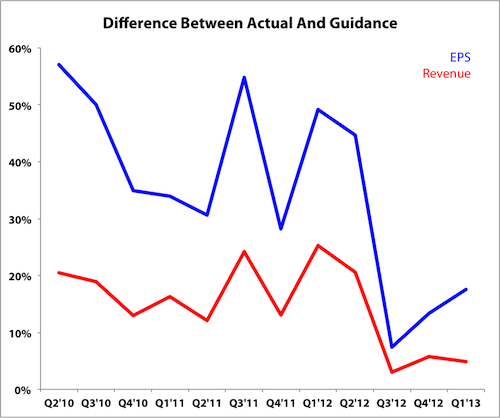 For the past three quarters, Apple's actual results have been relatively close to its guidance. Apple expects the current quarter to see sales of $41 billion to $43 billion, with gross margin of 37.5% to 38.5%. With an 11% plunge after earnings, some investors are obviously panicking. At that low, shares are just a 3% sell-off from tapping fresh 52-week lows. Moves of that magnitude are common nowadays with the negative sentiment surrounding Apple lately. As Apple flirts with new lows, investors are overlooking the fact that it just posted all-time records in three of its most important metrics: total revenue, iPhone units, and iPad units. Meanwhile, its cash balance has swelled to an incredible $137.1 billion, representing 32% of its market cap. Its P/E now sits at 10.4, and backing out the $146 per share in cash brings that figure down to 7. A pullback on these results could have been reasonable if shares were at all-time highs and Apple's P/E was in the "lofty" territory of 16.3 (gasp!) when it peaked in September. Some figures could have been better, but an 11% plunge amid low expectations to add on to the 27% already lost is nonsensical to say the least. When the terror subsides, will you still be holding (or buying) shares? Let's hope so. As myopic traders dump their Apple shares en masse, will you have the resolve to hold your ground -- or possibly buy more? Emotions aside, Apple's growth story is far from over and it still has massive opportunities ahead. We've outlined them right here in The Motley Fool's premium Apple research service, and it may give you the courage to be greedy when others are fearful. If you're looking for some guidance on Apple's prospects, get started by clicking here. The article Apple Shares Plunge After Earnings: Are You Panicking Yet? originally appeared on Fool.com.